【Drift off to Dreamland】: The 5 natural sound settings (White Noise, Rain, Lullaby, Ocean, and Brook) create a soothing environment that promotes sleep, relaxation, and concentration. A back light panel provides soft, ambient light. 【8-hour Prolonged Playback】: Each full charge provides up to 8 hours of playing time. 【3 Auto-off Timers】: Setting the sleep timer will automatically turn off the device after 30, 60, or 90 minutes. Drift off to sleep in an energy-friendly way. 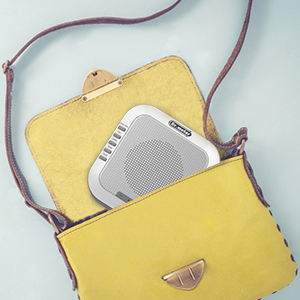 【Portable for Travel】: The compact design easily slips into any suitcase or backpack. Never miss a night of sleep again, even on the go! 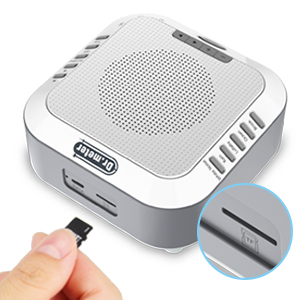 【Micro SD Card Support】: The micro SD card slot allows you to enjoy your own music and customize your experience. Micro SD card is not included. You spend a third of your life sleeping-why settle for tossing, turning, and restless nights? 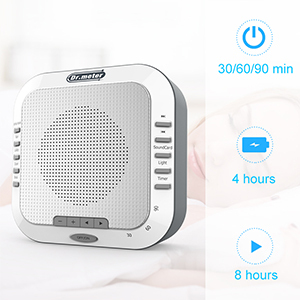 Take your sleep seriously with the Dr.meter Sound Machine. The Dr.meter sound machine uses 5 natural sounds to ease your mind and wash away the stress of the day. The peaceful, steady noise will instantly relax you and lull you to sleep in a matter of minutes. The Dr.meter Sound Machine does more than help you get to sleep¡ª it helps you STAY asleep. Whether you realize it or not, the seemingly harmless sounds you hear at night pull you out of deep sleep and decrease the quality of your rest.The machine¡¯s sound overpowers the obnoxious noises that might pull you out of your slumber. Have little ones? 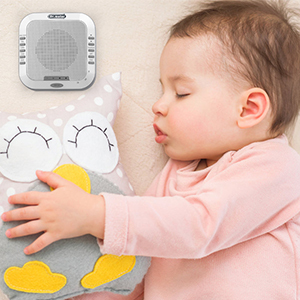 The Dr.meter's sound masking will block out the sound so that you can do what you need to do without fear of waking your child. Insert your micro SD card into the card slot to listen to your own music. You can easily shift from the built-in tracks to personal sound profiles. The lightweight cubic design allows for an easy fit into a bag or suitcase-it's the perfect travel companion.